Rustic charm is so in, yet in my mind I think it’s more than a fad. I see it as timeless. As someone who loves color, I know I need decor items that are more neutral and calming to my excited color, Bohemian palette ways. 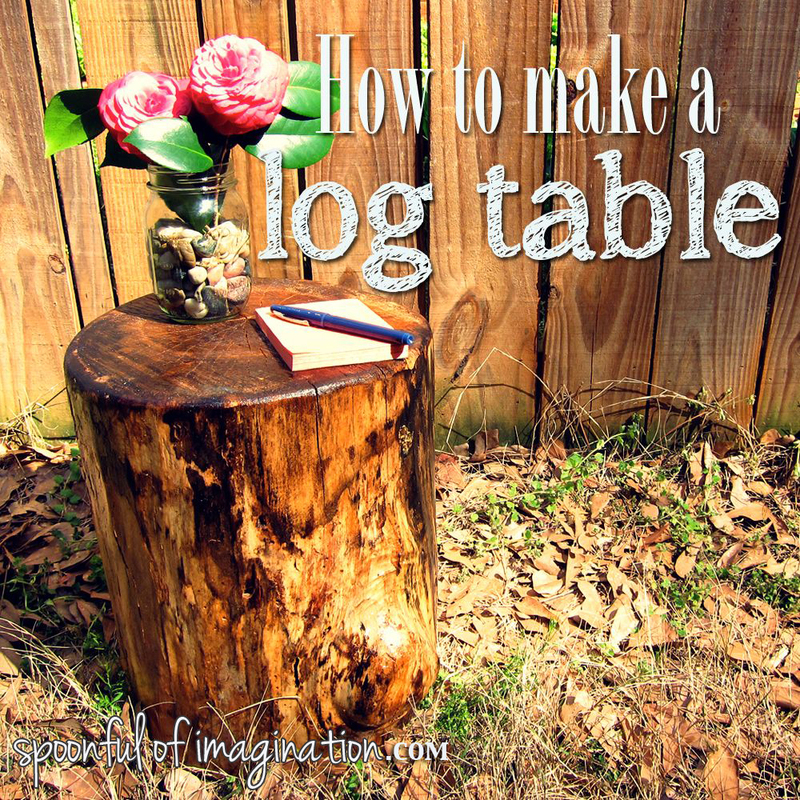 I came up with this log table as a subtle way to add some rustic charm in our decor. My parents always have a fire going in their wood burning stove during the winter. It is a way they keep the cost down for heating their house, and I love it. A warm fire to sit by with family is one of my favorite things. One of the benefits of visiting them is they always have firewood. 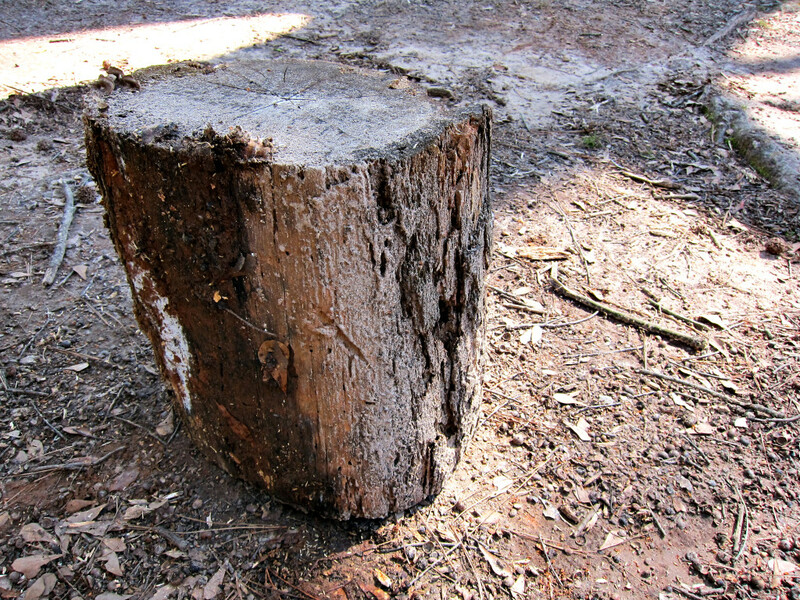 On one of my trips out to their place, I snatched up this old log that they were going to chop into firewood. First, I ripped off all the peeling bark and scraped the sides till they were smooth. Next, I gave it a good Clorox bath. I forgot to take a picture of this step, but I literally filled one of our big outside trashcans up with water from the hose and dumped in a lot of Clorox bleach. I let my log soak in there for a couple hours, and I then removed it to let it completely dry. The drying step took a couple of days, but it was worth it. Not only do I think I really killed anything inside my log or growing on it, my log was lighter in color. I really liked the way it looked. I then sanded the edge of my log to give it a rounder curved edge/table side look as well as sanded the top to make it a smoother surface. My final step was to seal it shut. 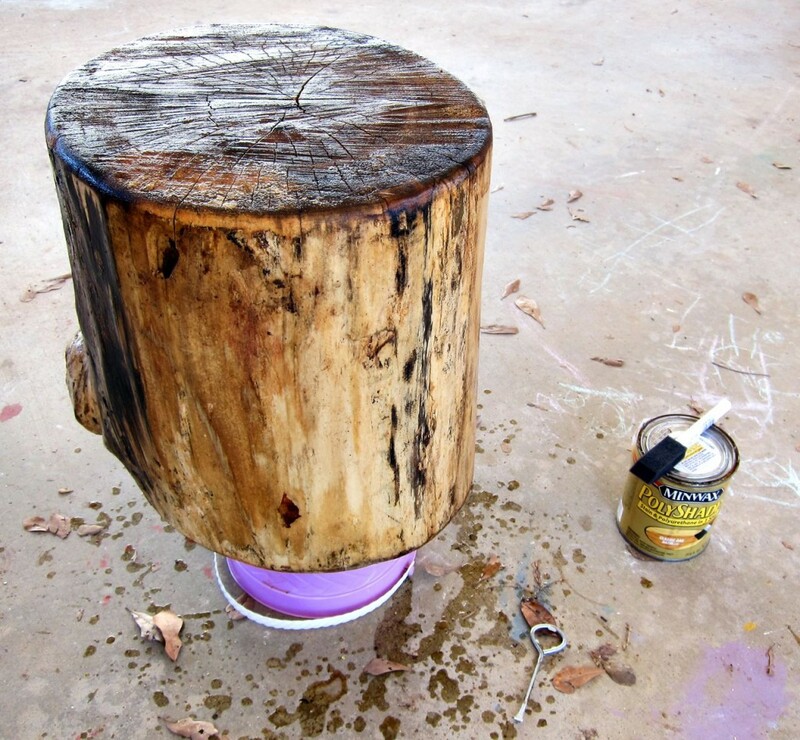 I had a stain and polyurethane sealer in one and used it to paint four coats on to my log. I let it dry completely between each coat. This project took a series of days because of all the drying that was required, but each step was not hard and didn’t take long. After the last coat of Polyurethane, my little end table was finished! I love the way it looks and feels. I’m not sure if it was the stain or the polyurethane part in my sealer that created the darker/burnt top look, but I love it. I guess those wood fibers were just softer or something, so it took the sealer differently. This table was so easy and feels free since I had the sealer and bleach. I think it will be striking in a room. 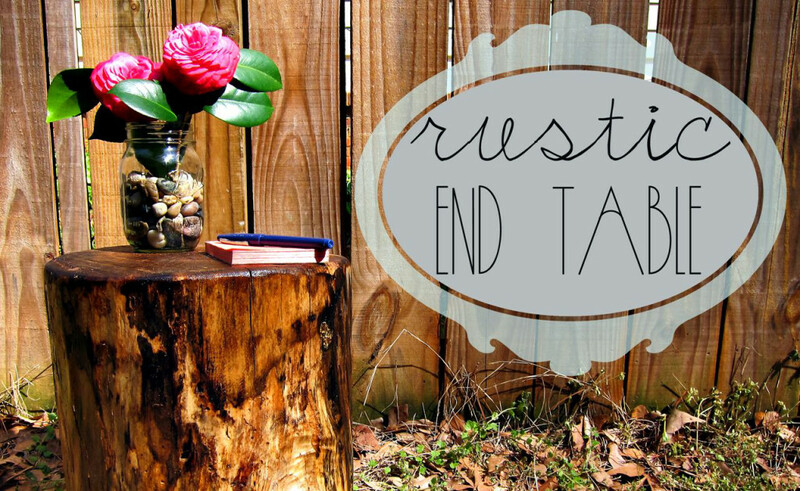 Have you ever created an end table like this? Or taken on a project that your husband looks at you like you might be a bit crazy when you are describing what you are doing while loading your van with an old log? I can’t wait to find a place for this little end table in our new house. What do you think? Are you on the hunt for a chainsaw and old tree now?? Thanks so much for stopping by! Very cool! Can’t wait to see it in your new house. I love it! We have been cutting down trees in our new(ish) back yard. 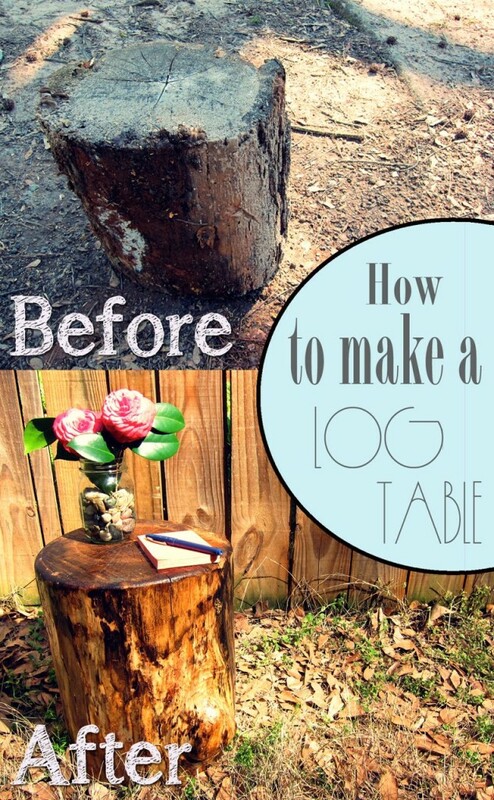 I would love to do this with some of the logs. They will look great on our patio! 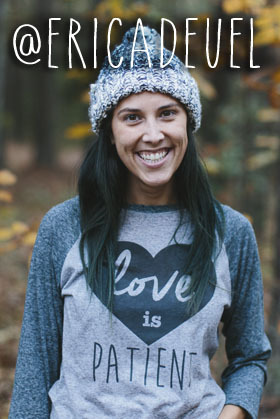 Would you do anything differently if you were planning on keeping it outside? Thanks Rachel! I love the idea of using them on a patio! I might have to make some more! This is the first I have ever worked with a log before, so I kind of experimented doing this project. I wish I had an experience with it outside to tell you better. I think it could totally work. I would just look for a polyurethane that is weather tight and says it can be used outside. Maybe when you are at Home Depot or Lowes you can ask an employee which one would be best to use outside…and then just do lots of coats of it on your log? I hope this helps! Just wondering – what color was the stain in your stain/polyurethine sealer? Ohhhh I wish I could remember to tell you katie! I know it was one of the lighter stains, but I can’t remember. I used the rest of my can on that wood log too. I’m sorry I can’t be more helpful. I think any shade would be beautiful though! Just love this. My husband has made several since we moved to the mountains. 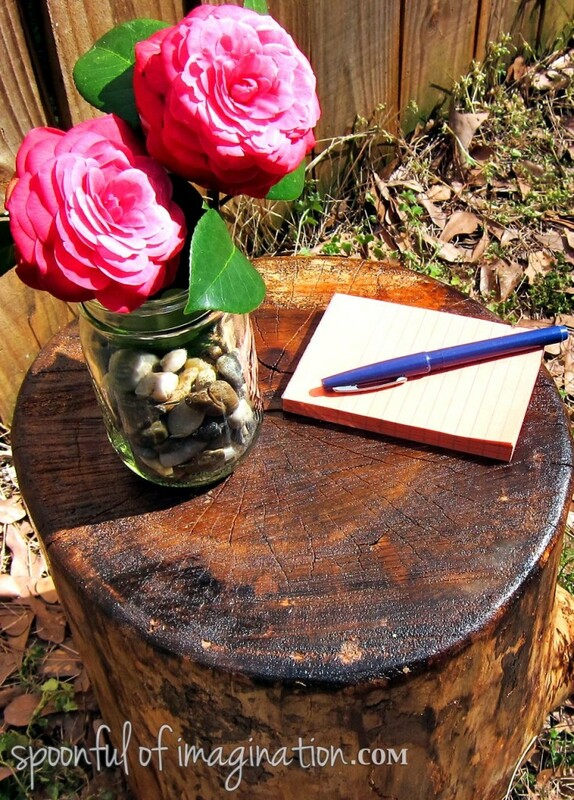 Hi there, Love the log table and honestly scanned your directions very quickly … can you tell me if you let it age awhile before you did all the finishing?